I’m still reading Nixonland by Rick Perlstein, initially prompted by the mention of Fox News’s Roger Ailes‘s early work as a Nixon operative. Ailes is credited with teaching Nixon how to succeed in the world of television — by bending reality, faking news events and running highly staged ‘impromptu’ candidate meetings with ‘off the cuff’ Q&A sessions, rigging the game and so deeply controlling the slavering press — cynically mastering the medium. Gee it’s a good book but the tale it tells is AWFUL … and the detail of the ‘dirty tricks’ goes so far beyond fair play it’s almost unbelievable! The cynicism, the criminality, the paranoia, the determination to crush ‘enemies’. 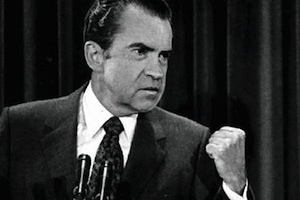 The description of the Republican/Nixon campaign’s machinations and dirty tricks (stealing campaign stationery and sending out smearing gossip, untrue rumours,misinformation, fake invitations, venue changes, phoney travel schedules, ordering cars and food to be delivered to opposing campaign HQ) and darker, malevolent tactics — tricks collectively called ‘ratfucks’ within the Nixon camp, and carried out by ‘ratfuckers’ — remind me of some of the stunts we see here in NZ politics. George W Bush’s henchman Karl Rove makes an appearance as sleazy political saboteur. Gee, way back then, I thought. The die is cast. All of which put attempts at de-stabilising personal abuse I’ve read in various right wing/National Party blogs (not just puerile put-downs of Auckland Mayor Len Brown by his instinctual political enemies) into a context. Clearly, dirty tricks and devious lies are not an aspect of politics only limited to the right wing. Obama’s Chicago machine (and John F Kennedy’s before him) have been accused of all sorts of skulduggery. True? Dunno. Possible I guess. I find myself again struck by the desperation of today’s Republican political campaign to do anything, say anything they can to discredit Barack Obama, or to build on negative prejudice against him (or Michelle, seen as a threat too). From Sarah Palin’s “death panels” campaign and the bare-faced lies propagated by opponents of the Democrats’ health care reform. Consider all the BS about the birth certificate and any other manufactured controversy. It’s a dirty, dirty game and some operators will lie crookedly for the slimmest of political advantage. And so we have Fox News. But let’s be clear about one thing: in this partisan war the ‘issue at issue’ could be anything. The tribes don’t really care what they are fighting about … just that they are at war, and that ‘at war’ ness becomes inextricably bound up with their own sense of identity. In my comments on the ‘Appeal to decency‘ post I quoted part of an article by Johann Hari: The Republican Party Is Turning Into A Cult which encapsulates a lot of my own thinking about these matters — chiefly, the trenchant misinformation and lies (let’s call a spade a spade) deliberate ignorance and misuse of ‘religious faith’ as a justification of near-hysteria based on lies and falsehoods. But this kind of mania can’t be co-opted: it can only by overruled. Sometimes in politics you will have enemies, and they must be democratically defeated. The political system cannot be gummed up by a need to reach out to the maddest people with the maddest fears. In my career, I’ve seen public controversies whipped up and manipulated. Sadly, as if to reflect the truth of the proverb ‘A lie is halfway round the world before the truth has got its boots on’ the argument is frequently dominated by those with loud voices and few scruples. Often it seems, it’s as if those who ‘win’, are those whose commitment to an idea enables them to lie and cheat to promote it — who, like Nixon’s infamous Committee to re-elect the President are, at the very least, motivated by the credo ‘the end justifies the means’. Thus we get: political gerrymandering, crooked politicians and corrupt elections, mud-slinging ad hominem attacks based on lies, misleading referendum questions — all in the name of a ‘good cause’ and ‘values’, you understand. So the question becomes: How do we defeat these lying liars and their lies? Reason and an attempt at rational discourse is like using a garden hose against a brush fire. It doesn’t stand a chance against the fixation and negativity. Comedy Central’s The Daily Show with Jon Stewart is brilliant encouragement but routinely outgunned, outspent and out-hyped by the Fox News blitzkrieg. Radicalised people of faith (whether Christians, Jews or Muslims) often practice a kind of inherent bigotry. It’s my experience that sometimes people spouting about God and ‘family values’ (codewords for the religious right) are open to issuing nasty bigoted propaganda and inciting hatred. They use lines like ‘This is a call to action!’ which can leave the followers or those exposed to their ‘message’ uneased, restless, and in some cases, primed for what their ‘pastor’, ‘shepherd’ or ‘bishop’ or Rush Limbaugh/Glenn Beck/Bill O’Reilly-type might incite them to go out and DO. It’s this arrogant ‘bible-based’ moral ‘certainty’ which led the Bush White House neocons to invade Iraq, it’s the ‘certainty’ that Jesus will come back and rescue the planet when it’s on its knees which promotes the short-term ‘f*** the planet’ environmental myopia of ‘drill baby drill’ and the right wing so-called ‘myth’ of climate change. ‘Moderate’ Christians can sometimes appear to be comprehensively out-thought by these ‘radicals’ or ‘fundamentalists’ … and thus find themselves led by the nose or too squeamish to SPEAK UP (while feeling conflicted about how they should ‘stand up for Christ’) into forays their heads tell them are unwise. I am as struck at the open bigotry of some of their messages — racially or culturally inexplicit condemnation of ‘the other‘. It really can fall not too far short of the rats down sewers imagery of Nazi propaganda … dressed up like a high school geography video about the population explosion — showing Muslims “out-breeding” Christians etc. Returning to the election theme, I’ll finish with a quote from Nixonland which highlights the problem an incumbant President can often face: resentment. Perlstein describes the ‘right-wing reaction to everything’ the Democrats and their campaign for civil rights and ‘reform’ in the 1960s represented. 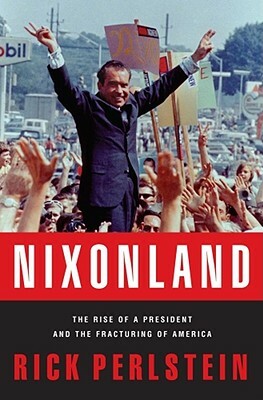 The story of Nixonland (and I’m about halfway through) is how Nixon and his team tapped that resentment and right-wing backlash and turned it into a thundering majority (Nixon’s ‘Silent Majority) to the Republicans’ advantage in 1972. It is hard to argue that most of the better Presidents were Republican since WW2. In fact, it is difficult to many good Democrat Presidents. Truman was good. Kennedy was promising. Johnson was quite poor. Carter was completely useless – clearly the worst President in the list. Clinton was a bozo. Obama is inoffensive, but doesn’t seem to be the man for the crisis that we have. It will be interesting to see who the Republicans choose next time. I actually thought Mr McCain was a very good candidate last time, but the media were very biased against him, and Obama’s campaign was very slick (now this will be harder to replicate because Mr Obama will have to campaign on his rather average record) so that the old guy never really stood a chance. There is a definite liberal bias to US news. The Republicans don’t tend to moan as much about this. 1. Democrats have often performed poorly in power. Thanks for offering your analysis Poormastery. With respect, I think the two-horse race (Dems vs GOP, right vs left) is merely ONE parameter with which to measure political players. Sadly, I think we suffer when we use shallow Party membership as a gauge for evaluating politicians, their actions and their outcomes. Also the 32/36 split seems problematic (as superficially appealing as it is). For instance war is a confounding factor, let me suggest. It seems to me that conservative politicians are more likely to be returned in times of ‘national crisis’. Does that imply they are the ‘natural party of government’? Maybe. I prefer another approach, which is not quite as straightforward: Wet vs dry. Despite declared party affiliations. Consider Robert Muldoon a supposedly National Party right wing Tory, yet presiding over an expansion of welfare state-ism, big govt and closed economy … rightly compared to Albania. Consider Roger Douglas/Lange govt – supposedly a Labour Party (unionists) but Douglas, captured by the Chicago School of Economics apostles in the Treasury, pushing through economic ‘reforms’ waaay out of character for such a Party. 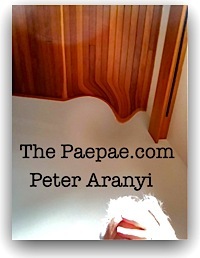 Consider the Bolger government’s efforts to honestly settle Maori grievances/Treaty of Waitangi claims. Doug Graham (now Sir Douglas) was the right man in the right place for that attempt at a NZ version of truth-and-reconcilliation — who’dathunkit for a Tory government. There’s more to the story than ‘big taxes and big government spending’. Thank god. And of course, let me be the first to admit that sometimes politicians act EXACTLY to type — Tories thumping the working class, Left-wingers cutting farming subsidies, Left wingers borrowing and taxing to ‘spread the wealth’, Right-wingers selling state assets and introducing ‘competition’ to ‘state monopolies’ to reward/enrich their mates. I remember feeling unable to criticize Jim Bolger and Bill Birch on some (now forgotten) sop to their constituents because, dammit, they’d campaigned on that very policy as part of their election manifesto. Although I personally disagreed with the policy, I had to admit they had a mandate. That’s democracy for you. When I look at the Presidents post WW2, it does strike me as a conservative list. In “wet vs dry” terms, there weren’t so many wets? NZ in 1970s to 1980s was certainly wierd politically. The 1984 – 1990 Labour government changed everything, generally for the better. It was more of a generational shift than anything else, I suspect. Sir Robert Muldoon was similar in some ways to the Eisenhower generation – but Eisenhower had left power way back in ’61. Personally, I don’t think there is some great anti-Liberal conspiracy in the US. Obama promised such a lot, and he hasn’t delivered that much. The economy is terrible. The voters are frustrated. In an economic risis, all the “entitlements” and “programmes” of the left (or the wets if you prefer) do not seem so affordable. Nor does the military spending of the dry’s. It matters, because bond markets (or actually bond investors) are becoming impatient. PIMCO has pulled out of US Treasuries. This was the canary in the coal mine moment…. If Obama wants to win, he will need to address the economic crisis and the huge budget deficit? It seems like his entire economic team has come and gone, and any economic policy he might ever have had was chaotic and ineffective? He needs to lift his game fast, in my view. Agreeing a sustainable budget is his first and most urgent task. The best example of this I have seen is in fact the “Left” – in particular Bono. The Live Aid rallies were quite like the Nuremberg rallies, staged to help the hopeless black man, who couldn’t even feed himself. Of course, history shows that the Carthaginian Empire and the Egyptian Empire had the most advanced agricultural methods of the age. Africa was more than food self sufficient for thousands of years, and also fed the Roman Empire. The racist interventions by Bono et al (why not allow black musicians to play?) has contributed to the recent poor agricultural performance of Africa. Opposing Western farm subsidies would have helped Africa. Sending extreme quantities of free food to totalitarian governments fighting civil wars didn’t have much long term benefit in terms of incentivising agricultural production. It simply propped the dictators up. Perhaps racism is not confined to the right, or the dry’s? What I like about discussion with you is it stimulates me to think. Can democratic (small d) politics — the bloodless transfer of power, a very modern idea — be seen as so much else in life: a cycle of seasons? I think so, without necessarily buying the Elliot Wave theory in its entirety. Clinton’s “it’s the economy stupid” applies in spades. GW Bush gave Obama a hospital pass any way you look at it … how much ‘control’ of global economic factors does any POTUS really possess? Influence, yes, sure, but wet (stimulus) follows dry. What do you make of the way McCain’s comment during the 2008 campaign that ‘the basis of our economy is strong’ (or words to that effect) reduced his electability? I don’t think there’s any doubt that political parties (left and right) and their officio and ex-officio workers ‘conspire’ to gain political advantage … and do so generationally. The Nixonland book is fascinating in part because of the cast of characters … many involved in US politics for decades. For sure, George W gave Obama a hospital pass. George W was an economic vandal, although he wasn’t quite in Gordon Brown’s league. Indeed, the “Great” Gordo handed over a steaming turd to the Tory / LibDem Coalition in Britain (with the infamous farewell letter saying “I’m afraid to tell you there’s no money left.”). Britain’s Coalition government has dealt with the unfortunate bequeathment of a huge structural budget deficit much better than Mr Obama has done so far. Indeed, Mr Obama has done nothing except spend pot loads more money that the US hasn’t got. As for Mr McCain, I doubt that anything he said made any difference. After eight years of George W, the Democrats could have put forward a donkey (they almost did with Hillary Clinton) and they still would have won the election. I can’t even blame Mr McCain for choosing the imbecile Ms Palin as his running mate – he needed to take silly gambles to give himself even an outside chance of winning. The media pretty much mocked Mr McCain, yet he was both an honorable man and would have made an excellent President, in my view. The Republican candidates this time are scary. Ms Bachmann is nuts. Ms Palin is an ignoramus. Romney – I don’t trust him. Gingrich – even less so. I quite like Ron Paul, but he is completely unelectable. As for these political guys being around for decades, I have heard that. I quite liked the movie “Primary Colors” about Mr Clinton. Personally, I have never belonged to a political party. Life is too short! The media pretty much mocked Mr McCain, yet he was both an honorable man and would have made an excellent President, in my view. McCain’s concession speech and his tamping down of jeers at Obama from his supporters was statesmanlike. Impressive. I also thought he did really well at the pre-election roast with Obama. I liked McCain, too, but was rooting for Obama/inspiration. Not without some disappointment. Agreed re Palin selection a desperate roll of the dice, but she ended up reflecting very badly on McCain campaign … poor vetting. Palin = a lightweight, a loose cannon, very polarising figure. I loved ‘Primary Colors’ the book, not seen the movie. ‘Anonymous’ author was Joe Klein.